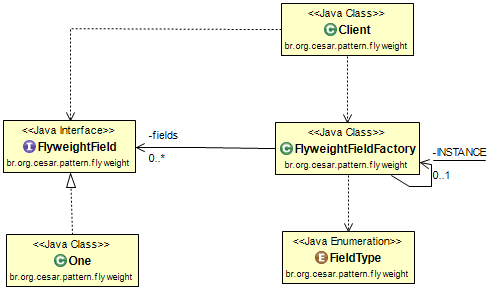 Today i'm gonna show the flyweight design pattern in action. The flyweight design pattern is a very useful programming design pattern while dealing with a lot of tiny, re-usable objects. In our example we will see, how we could use the flyweight pattern while dealing with lots of digits. Imagine you are writing a huge text file with a single big prime number. (memory issue) This could be a document with a few pages. All you need are digits to write the big prime number in it. So, you may create an object for every single digit, or you may create only 10 (0-9) and re-use it in the whole document. That's what we will do here. Pay close attention. Imagine how many other scenarios like this you may have in your applications. Imagine that those flyweights bellow are reusable classes like the numbers 0-9. If you want to write a text or equation, you'll be able to reuse it instead of creating a new object, every time you write a digit. That's the class which represents the types we just defined above. It will be used in the FlyweightFactory bellow. Finally the test. Here we can see a possible usage of it. The interesting thing is the fact that we are reusing the same instances instead of creating new objects. The get(...) function should instantiate the flyweight members, not the constructor. That way we can optimize the usage of memory. Only the asked members should be initialized. For example if we doesn't need nine1, than in Map there is no value for the key FieldType._9. Hi Márton, That's a nice improvement! In fact this would be true, if we assume that not all objects would be used at runtime. At the time i wrote this post, i was thinking about the alphabet and thinking of increasing application speed. Imagine that every alphabet object would be complex and time consuming while creating it (could be, just imagine it) and imagine that a text writer would for sure use all letter of the alphabet while writing something. In this case, it would be nice if i just lose time once, load everything into memory and from now on, just get the instances i need as the client requests it. I think that the pattern are not written in "stones" and could be adapted from case to case as long as it preserves its essence. But i agree with you! in the case we would not need nine and the creation wouldn't be complex and time consuming, then yes.